Think of any instrument brand and zZounds carries a wide selection on its website--and always at prices that overwhelm the competition. For the guitar player who aspires to be the next Eddie Van Halen, zZounds can steer that rock god in the right direction with a guitar that has got the perfect combination of style and playability. zZounds carries some of the most recognized brands of guitars on the market, including Gibson, Ibanez, BC Rich and Kramer, with most models in stock and ready for immediate shipment. Of course, you will need an amp to go along with that guitar, and zZounds carries a full line of amplifiers perfect for any musical situation. From a simple amp for practicing at home to stacks for playing a gig at a club, zZounds has an amplifier that is just right for the novice and the professional musician. The selections of amplifiers include names that are recognized throughout the music industry, including Fender, Marshall and Peavey. The knowledgeable staff will be able to assist any customer with any questions or concerns regarding any item that zZounds stocks. The staff at zZounds understands people who like to hit things with sticks, and is there to help those who drum to a different march. No matter the brand of drums, zZounds not only carries it, but also has a full line of kits manufactured by that company. From a Tama Imperial star drum kit to Ludwig drums--the brand that legendary drummer John Bonham played as a member of Led Zeppelin--zZounds has a kit that is just right in both acoustic and electronic instruments. For the bass player influenced by Geddy Lee or Gene Simmons, zZounds carries a full line of Fender basses, including several jazz basses to choose from the Cort Axe Bass and the Cort Punisher 2 bass. Both of these basses were designed by Simmons, and the Axe base is usually featured in many of his live performances with Kiss. For an entertainment company specializing in everything from wedding receptions to music events that require a disc jockey, zZounds carries a full line of public-address equipment and DJ gear. Its selection of gear is unsurpassed and you can find everything from name-brand turntables and mixers to power mixers. If it has anything to do with live entertainment, you will find it at zZounds. zZounds is a full-service musical instrument and accessory website featuring guitars, drum kits, amplifiers and other musical accessories at prices that beat the competition time after time. The company makes it fun to purchase instruments and other musical gear, and it offers some of the best deals on name-brand instruments, equipment and accessories available anywhere on the Web. The staff members at zZounds are actual musicians who play the same instruments that many of their customers call about or ask questions about through the website, so they have the knowledge to help customers make the right decisions about any instrument or accessory. Share what you think about zZounds, and your favorite ways to save there! 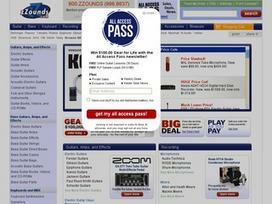 Much Better deal compare to other music stores. I love the Play as you pay option. This makes buying gear so much better. Unbeatable prices on instruments and accessories. wow! i like this site because it has good offers!! Zzounds is an outstanding tool for the budget conscious musician's . The easy payment plan makes it possible to own that dream equipment you always wanted. I have never had any difficulty with the site and the staff is very courteous and professional. I recommend Zzounds to my fellow friends and musicians all the time. best place to shop on the net. Zzound is awesome. I could have never bought my Grace Potter flying V without the 8 pay plan. You guys rock. And so do I now thanks to you guys. I think zzsounds is an amazing shopping site as it offers discount. Zzound rocks!!! I am a filmmaker and do my own musical scores. Zzounds have helped me build my mini recording studio. found everything I was looking for in one site... thanks! !